Principled Technologies executed four typical deployment and management scenarios using both HPE Synergy and Cisco UCS. 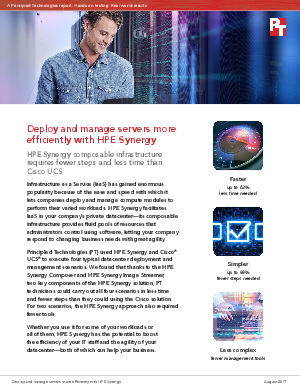 They found that HPE Synergy saved 71.5 minutes and 86 steps, and used four fewer tools compared to Cisco UCS. In a hypothetical 200-node datacenter, that’s a total of 9 work weeks, or just over 2 months’ time savings on routine tasks.